Ah yes- the old open a franchise… steal the recipe… decide you don’t want to pay the royalties anymore game. If this whole thing sounds familiar, it’s because it is. Shorty’s (on 9th Ave. btw. 41+42nd) did the same thing to Tony Luke’s. Thankfully for Midtown Lunch’ers one commenter is reporting that the chicken pretty much tastes the same as it always has, but I’m guessing it still takes forever to get your order. 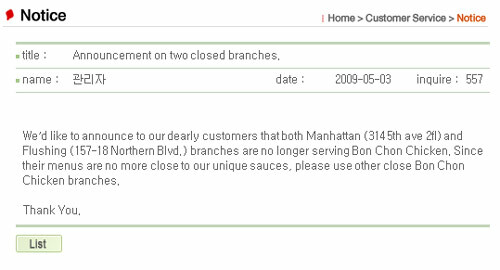 Thanks to Lunch’er Paul for passing along this link to the Bon Chon Website. Posted by Zach Brooks at 8:30 am, May 13th, 2009 under Mad For Chicken. I was there just this past weekend, it’s the same chicken as far as I can tell. Yawn. Let me know when Kyedong opens in Manhattan. I was there 3 wks ago, the chicken still tastes about the same. But they did away with the cabbage and replaced it with carrots/celery. This isn’t Croxley’s, it’s Bon Chon, WTF. I went to the Flushing MFC on Monday night. I’m not sure if it was because it was fairly empty, but service was incredible. Insanely attentive to your every need, and they bow everytime. i might even say it was a little TOO much. as for the food, i guess its the same. it may just be “placebo” effect, but it did taste different, still good, but different. the spicey was definitely spicier. it comes with a regular salad (lettuce and such), and with the chicken is a long spiral cut potato, very interesting, just a fancy french fry really. you still get the pickled radishes, tho i think if you ask for more they charge you extra. and to start, they give you a bowl of popcorn (seasoned, not exactly sure with what). pretty tasty tho. we sat near the window, so it was interesting to see people when they realize its no longer Bon Chon. I went there & it was still same good chicken. not that many ppl for lunch so I got my order quick. Bonchon copied Kyochon but it’s more famous here. so who cares who’s original if all taste pretty much the same. I wish they have happy hour then I’ll go more often. I’ve been to the Manhattan branch twice since the change, and the service has been terrific each time. Drinks came quickly, and the servers were present whenever we needed them. The chicken took forever, but came out hot and perfectly cooked, so it’s not like they were ignoring it in the back. I just went to Mad For Chicken yesterday, because Kyonchon wasn’t open yet. We got the large combo, and I split it with a friend. Extremely delicious, crunchy, and spicy. 20 bucks fed the two of us (slightly expensive). The food took approximately four hours to make, though. Got food to go, and in the wait I got a Martini from the bar. Bartender didn’t really know what he was doing (probably because it was 11:30 AM and I’m not sure you have a bartender working at that time). Friend ordered an extra dry Bombay Saphire martini. What he got was 1 oz if gin and 3 oz of dry vermouth. The martini was yellow. I saw what he had, so I ordered a Tangueray martini, extra dry. I explained to him that I only wanted a dash of vermouth. I don’t think he spoke english because he them poured me a shot glass full of red vermouth, which he about poured into my drink. I stopped him to tell him he had the wrong vermouth, but then thought I wanted both sweet and dry, and then he wondered why I ordered a martini if I just wanted a drink of half sweet and half dry vermouth. I got him to finally put the red vermouth down, pick up the dry, and then give me a shot glass full of it. I explained to him that I only wanted a small amount of it, and then he because to ask me how many “ouze” I wanted. It took me a while to figure out he meant “ounce” so I said one half, so he poured the whole shot glass (which was a double shot glass, so it was probably 4oz) into my martini. I won’t go there again, unless I call ahead and take it out, nor will I order a drink there. Do they give out engraved plaques for ‘official asshats of the year’ ? People that comment on the length in which it takes to get your food. you do realize its because of the way its cooked, right? you dont just dump it on a vat of oil and it comes out as delicious as it is. its made when you order it, not sitting under some heat lamp. these things take time to cook to make it so darn tasty. its like complaining that your turkey takes 4 hours to cook on thanksgiving. Mamacita, I totally agree with you.